Roller shutters offer you more benefits than just safety, there are also excellent financial, environmental and ergonomic reasons for having them installed to your home, business or investment property. While for more light and breeze, the shutter can easily be adjusted to any height position on your window giving you full control of your home’s temperature and privacy. Roller shutters have been proven to reduce the amount of traffic and neighbourhood noise entering your home by up to half. Roller shutters have also been proven to lessen your heating bills and the need for air-conditioning, something that can only be a good thing in times when energy costs are rising and more emphasis is being made on lowering individual carbon footprints. Between the aluminium facings on each of our slats is a 100% polyeurethane foam core. This forms a multi-layered insulation between the world outside and the glass of your window. These slats, designed specifically for Australian conditions, keep the heat out in summer and the warmth during winter, ensuring that you save money and lessen your impact on the environment through energy usage. Roller shutters also provide year-round protection against wind, storm damage and damaging UV rays. 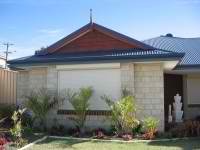 Roller shutters are assembled using interlocking aluminium slats engineered to resist penetration from outside force. To increase the safety of your property the Horizon Shutter’s internal locking mechanisms locks the shutter in position when down. Our range of Shutters are available in a twelve fashionable and classic colours, all carefully selected to complement any home or business colour scheme. For something slightly different consider contrasting coloured slats to achieve a highly aesthetic effect. Mr Rollershutter’s Horizon Shutters will not only look good on the outside of your house, but with the increased security, lower heating and cooling bills, and less interior damage from the harsh effect of the sun, they will easily add value to your home too!